Well it's September 1st, another Summer is coming to an end, let the mourning begin! The annual mad scramble has begun as we grasp at the last few remaining days of the Summer of 2011, trying desperately to squeeze every last ounce of sun out of the ever shortening days before the snow and wind blow in. Each moment of warm weather a blissful escape from the creeping hand of Ol' Man Winter lurking just beyond the corner of the next few calendar pages. But before the skies darken and the sun takes a vacation there are still a few festivals to be celebrated and none more exciting than the 3rd Annual Muskoka Beer Fest. 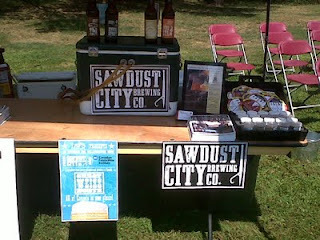 A day to celebrate not only the best of Summer but also the best of Canadian Craft Beer and Sawdust City was there too help out the best it could. We still didn't have any signage made up so I had to stop at the local Staples on the way to the Fest and throw together some last minute DIY signage. Not bad...not great, but not bad. Baby steps people, we're still growing, you gotta cut us a little slack! A lot of people asked questions about the bottles and were excited to try our brands, but like I said, we don't have our manufacturers license yet. But have no fear people the process has begun! As of Friday, August 26th, the papers have been filed. I personally went down to the AGCO office in Toronto and handed in our application forms. Now it's in the hands of the government. So in the requisite 8-1200 weeks I should hear something back. The rusty wheels of bureaucracy have started turning people! But enough of that. Let's focus on the good stuff. 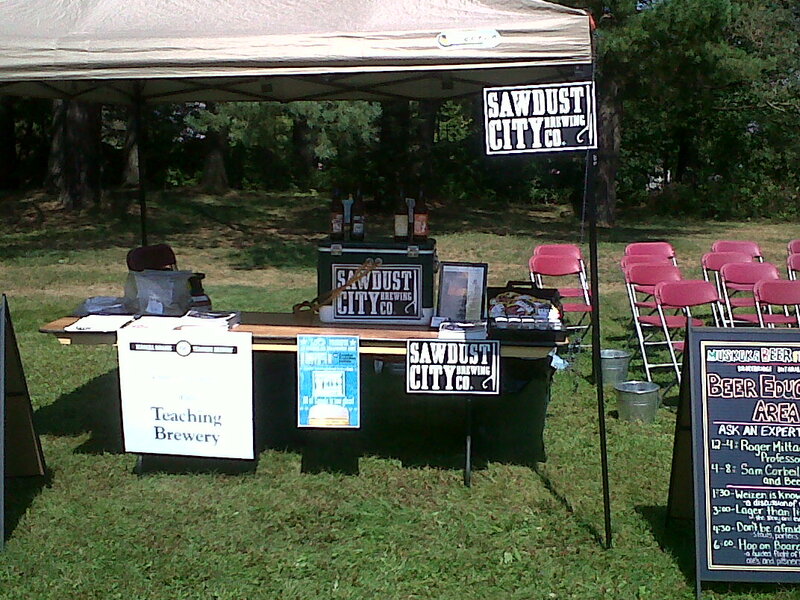 This years Muskoka Beer Fest was the most successful to date with around 1800 people coming to sample some fine crafted beers. And fine they were, it was just great to be invited to a festival (our first one too!) with so many great breweries . Along with that, each year the public seems to get a little more educated and a little more daring when it comes to craft beer and it's really exciting to see people coming out and asking more and more knowledgeable questions. I'm glad to see so many people learning about and getting out there to try the beers made by craft brewers. It's very uplifting, especially as a prospective new brewer coming into the market. The guys from the Griffin also added a little extra to this years Festival as well, throwing an after party at the Griffin once the Festival wrapped up around 8p. Because the one thing you need after a day of drinking is more beer. Really it's for the best. All and all it was a fantastic day and as far as first beer festivals go, it was really successful for us at the Sawdust City Brewing Co. A big thanks to Jed and Curt at the Griffin and also to all those that came out to support craft beer. Anyhoo, that's about it for now. So until next time, keep the beer in your mugs and the sawdust beneath your feet.